With the ongoing refugee crisis that is causing mass displacement across the Middle East and into Europe, there are many who want to lend a helping hand to those fleeing torture and persecution, and while the natural response is to donate money, time or goods to people and organisations assisting refugees, it is also natural to want to find ways to help people once they have resettled. One of the ways we can do this is by providing professional services to assist refugees who have settled into a new life in a new country and who are looking to re-enter the workforce. 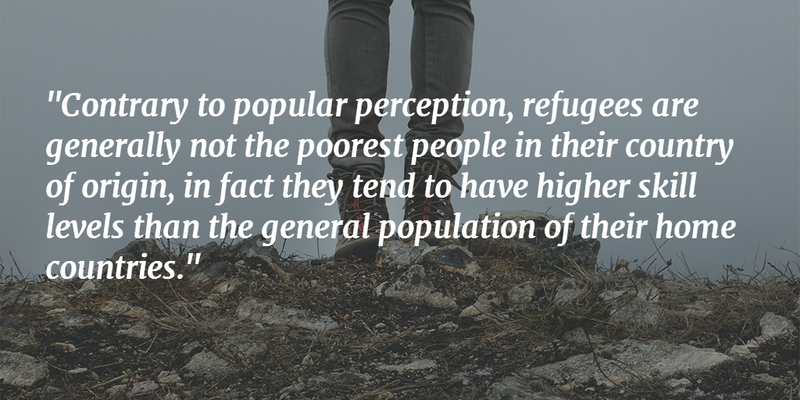 So how do economies utilise the skills and knowledge of refugees? How do we, as an industry, assist those entering our workforces to develop themselves in a manner which will ensure their ability to participate in and contribute to their field, and utilise their skills once they have been resettled? It is vital that refugees are able to access the labour market as early as possible, as studies have shown that labour market integration is an important factor in both the short and long term integration of resettled refugees. 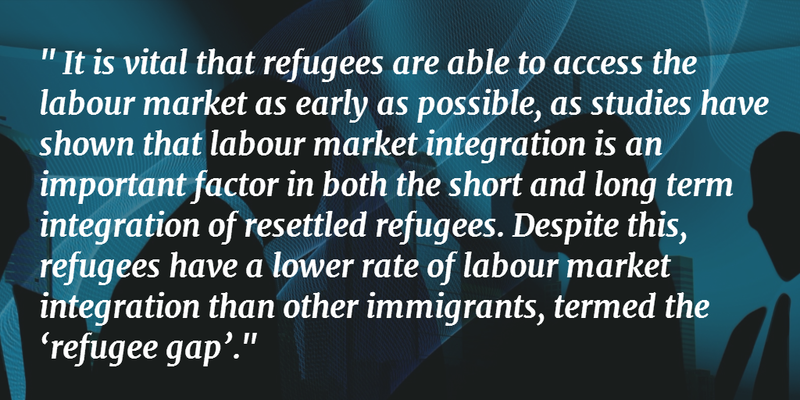 Despite this, refugees have a lower rate of labour market integration than other immigrants, termed the ‘refugee gap’ (2). The first steps to integrating refugees into the labour market are always going to involve language training and training to understand and overcome social, cultural and professional barriers, as no matter which country people are resettled into, there is going to be a period of adjustment. Many European countries have induction programs for refugees that assist with this integration (1), while charities, such as RETAS (The Refugee Education Training Advice Service), provide vital training in job skills and CV writing, as well as money and IT skills through its ‘Steps to Settlement’ project (3). This is certainly an area where individual L&D professionals could look into providing or volunteering services to assist refugees in their quest to become self-sufficient and better understand the environment within which they aspire to work. One of the biggest problems, unsurprisingly for the L&D industry, is that programs to integrate refugees into the labour market are generally not assessed for their levels of success, with statistics on labour market integration reported on poorly or not at all. Thus both government and non-government programs, such as the USA’s government sponsored resettlement program which is funded to the tune of $1 billion per year, do not have data which demonstrates the effectiveness of their programs or how to improve them (2). One statistic which appears universal, however, is that refugees as a group are overqualified for the work they are doing, holding a higher degree of qualification than their employment. This ‘brain waste’ is most aptly demonstrated by the documented experience of Iraqi refugees settled in the USA and EU, who have suffered a decrease in their socio-economic status and their relative earnings from previous occupations in Iraq. Reports on Iraqis who settled in France highlighted their difficulties in obtaining recognition for previous qualifications (2). 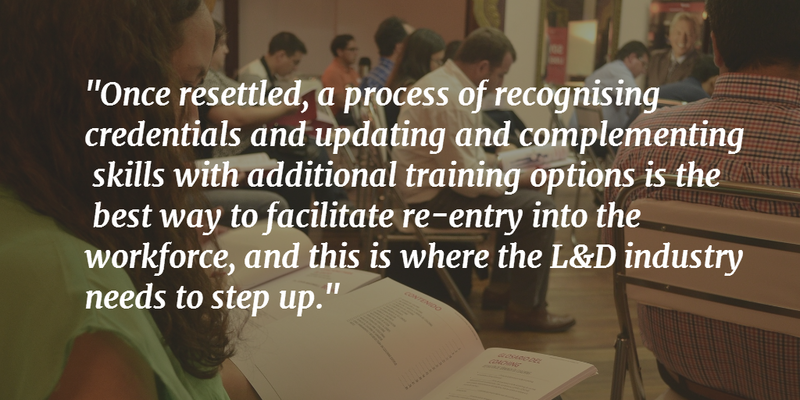 Once resettled, a process of recognising credentials and updating and complementing skills with additional training options is the best way to facilitate re-entry into the workforce, and this is where the L&D industry needs to step up. Just because refugees are skilled and educated in systems that are not aligned to those in the OECD does not mean that these skills and knowledge are unusable. Indeed, the opposite is true. With appropriate training that bridges the divide, there is no reason why refugees cannot utilise their skills and experience in a labour market that is undergoing rapid change requiring all the knowledge and skills capital it can get its hands on. Without a governing body to recognise, legislate and advise on foreign obtained vocational training and university qualifications, the L&D industry as a whole lacks the capacity to swiftly assess and advise refugees on the best course of action to re-enter the workforce, particularly as refugees are generally re-entering work after long periods of unemployment. To combat these shortcomings, L&D professionals need to expand their thinking to better accommodate those who have been out of the workforce and whose skills require updating or bridging to ensure that refugees do not end up either under-employed or unemployed due to short-sightedness on the part of HR departments. With report after report being published across business journals lamenting the difficulties facing businesses in the war for talent, and the heartbreaking stories being told of people sacrificing everything to bring their families to safety, to settle into new homes, new cities and new careers, it is incumbent upon the L&D industry to play a role that meets both needs and requirements. To provide recognition of education, skills and experience, to provide development opportunities that assist refugees to become business-ready, and to assist organisations towards filling talent gaps with able, talented and motivated professionals who have already proven their resilience and ability to overcome any obstacle put in their path. This entry was posted in Opinion and tagged CPD, crisis, development, empathy, employee development, engagement, help, knowledge, learning and development, opinion, opportunity, professional, qualification, recognition, refugee, refugee crisis, respect, responsibility, skills, statistics, teaching, training, training and development. Bookmark the permalink.